MOUNT GILEAD — Road levy funds make a big difference as 18 county roads are slated for paving this fall. The southern half of the county is getting a head start on road work with portions of seven county roads already completed. Residents on County Road 114 (Mateer Road) gave their opinion on road paving near their homes while they watched nearby County Road 124 get paved last week. Valerie Douglas lives around the corner from Walters on County Road 114. “I really want something done soon on County Road 114 to save my car’s suspension. We have potholes when we pull out of our drive in both directions. Even if they would just fill the potholes and then chip and seal, it would help,” Douglas said. County Engineer Bart Dennison is glad to hear Walters’ praise of the work going on and also understands the frustration that Douglas has. Dennison said the priority for what and when roads are paved is determined by two factors. One factor is road condition and the other factor is the amount of average daily traffic. The county engineer’s staff does car counting with strips on the road every couple of years. The engineer also drives all 380 miles of county roads regularly to get knowledge about the conditions. On a scale of 1-10 they get an average over 10 years of the roads with the highest traffic count and with the worst condition. Dennison reminds county residents that this is the first year of the five-year roads levy. The goal this year is to have 55 miles paved by the end of the year of the 300 miles of Morrow County paved roads. Contractors are laying two courses of hot mix asphalt on roads this summer. The first course is ¾-inch followed by a 1-inch course of asphalt. There is also a maintenance plan for chip and seal of some roads. Iberia Earthworm is contracted to do the chip and seal this fall and the asphalt paving is scheduled to be done by November this year. The asphalt paving is split between two parts. The southern part of the county is contracted to Mid-Ohio Paving of Centerburg. Four other companies also bid on this contract. The northern half of the county paving contract was awarded to Shelly and Sands in Mansfield. Five companies bid on the northern part of the county. Dennison said there was a considerable savings having the two contractors divide the work. Because bids came in at a reasonable rate they are able to add more roads to the list to be paved this year. Commissioners set up a special fund for the 1.9 million dollars that will be available for paving this year. County Auditor, Pat Davies reported that $1,520,000 has been received in levy money so far this year. The hot mix asphalt being used costs $60,000 to $70,000 per mile. 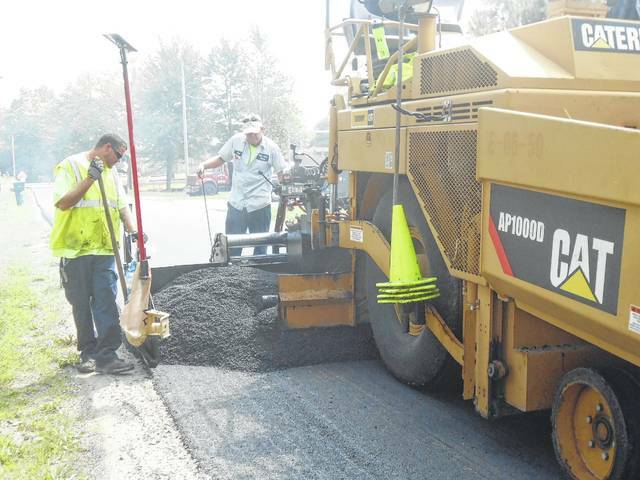 The levy money allows the purchase of more asphalt at a better rate for the contractors. “We want to show voters they can put confidence in us to get the job done right with quality work,” said Dennison. Walters’ only concern is that there will be more accidents due to people speeding on the smooth roads. Steam rises as workers from Mid-Ohio Paving of Centerburg apply a second course of hot-mix asphalt on County Road 124 last week. https://www.morrowcountysentinel.com/wp-content/uploads/sites/29/2017/09/web1_ROADWORK-1.jpgSteam rises as workers from Mid-Ohio Paving of Centerburg apply a second course of hot-mix asphalt on County Road 124 last week.